This individual Report Prepaid 2003: 31 Prepaid Market Segments Benchmarked is available for purchase. This Report is available to members of Mercator Advisory Group’s Prepaid Advisory Service. Please be advised that this Report is normally part of a research and advisory service that provides ongoing support throughout the year. As such, this Report contains significant depth of content that is selected for its strategic importance to our members. (For a description of these services, see our Advisory Services section). Fueled by rapid adoption of prepaid long distance calling, mobile minutes, and gift cards, most businesses are developing prepaid strategies and solutions. Knowing the current size of the prepaid market is critical to developing a successful business plan. 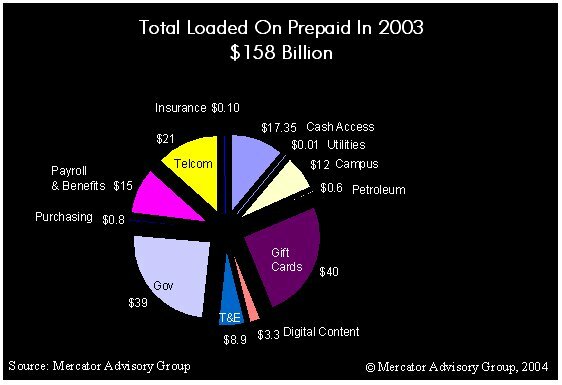 The Mercator Advisory Group report, "Prepaid 2003: 31 Prepaid Market Segments Benchmarked" is a critical tool for business planners because it identifies the total dollars loaded onto prepaid instruments in 2003 for 31 different market segments and calculates the total addressable market for prepaid instruments in those same 31 segments. By working with 2003 market data this report eliminates confusion caused when optomistic market projections fail to document the exact size of the market today and also fail to identify the limits of growth by ignoring the total addressable market that exists now. "Prepaid 2003: 31 Prepaid Market Segments Benchmarked" also breaks ground by taking a more expansive view of the prepaid market, providing a benchmark for any segment where goods and services are purchased in advance. This expansive view spans smart card applications, card products, coupons, mobile and long distance devices and even proprietary transit systems -- categories that are typically excluded from other research efforts. "Prepaid 2003: 31 Prepaid Market Segments Benchmarked" has taken this larger view because every segment of the prepaid market represents a significantly large number of consumers that have set cash aside for a specific product or service. Determining how that captive audience can be better leveraged to find new customers, increase revenue, and gain a greater share of wallet, will become the loyalty battleground of the future, and "Prepaid 2003: 31 Prepaid Segments Benchmarked" is the map every company requires to be in the game. "There are Prepaid market segments that are very close to saturation today, while others have incredible elasticity. Gift cards, for example, will likely morph into a packaged good launched through new and different channels. For example a toy store can arrange for local movie theaters to sell gift cards for the movie's action figures, or the movie theater can sell the DVD gift card as people leave the theater. The movie theater picks up additional revenue, the customer is approached when most likely to buy, and the merchants get the dollars locked-up before they are spent elsewhere. Prepaid is the strongest loyalty program ever invented, and it can be sold at the counter, on the shelf, or even through vending machine or ATM." The report provides current spending and total addressable market size information for the following segments: Business Time & Expense (4 segments), Cash Access (3 segments), Campus, Digital Content (4 segments), Gift Cards, Government (7 segments), Insurance Claims, Payroll & Benefits (3 segments), Petroleum, Purchasing, Telecommunications (4 segments) and Utilities. This report contains 46 pages and 13 exhibits.